K. Patira Wattanawarangkul, the Manager of TISCO Foundation visited Pathumthani Hospital, in Pathumthani and met Dr. Pramoj Sukvichai, Managing Director, about our medical fund to needy patients. 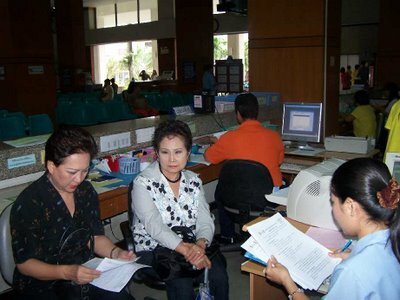 She also gave the application forms for medical, start-up and education funds to him for distribution, on August 28, 2006. The students from Rajabhat Chankasem University received canned foods, and used clothes from TISCO Foundation to be presented to the flood victims in Ta Wangpha, Nan, on August 28,2006. Khun Worayoodh Leelawejabootr of Commercial Lending, TISCO Bank and Working Group Committee, presented a cart and one umbrella for selling fruits to Mrs. Sakol Boonek on August 18, 2006. 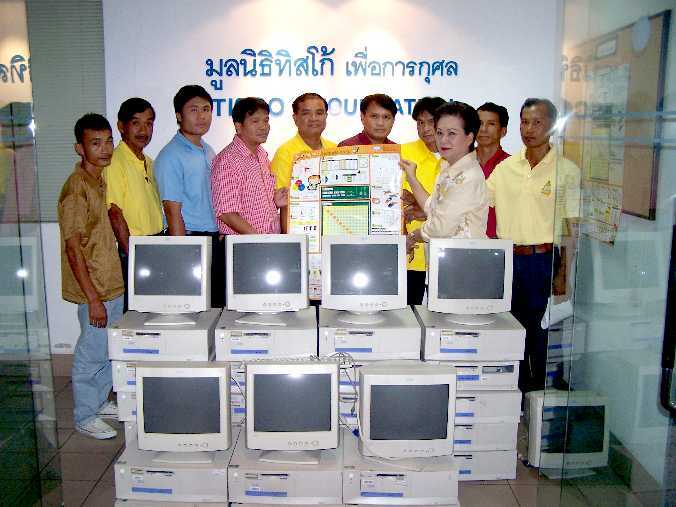 Teachers from Chumchon Ban Pako, Ban Bobab, Rajnukroh, Ban Praonua and Ban Viengkook Schools in Nongkhai Province, received 30 used computers and Daily Knowledge Posters from TISCO Foundation on August 18, 2006. Khun Pattira Wattanawarangkul, Manager of Tisco Foundation, visited Mr. Jee Kajornpu at Thammasat Hospital. He has a broken arm from motorcycle accident and requests a donation for an iron rod for arm. Khun Dusadee Rattanapapaschala, interviewing Khun Boonserm Boonnum in Singhburi. She requests a sewing machine as the present one is in bad condition.